Heat oven to 375°F. Spray 11x7-inch (2-quart) glass baking dish with cooking spray. Unroll dough into rectangle; cut rectangle crosswise into 8 strips so each strip has 6 pieces. At perforations, separate dough, or cut if necessary, to make 48 pieces. Arrange 1/2 of the dough pieces randomly in bottom of baking dish. 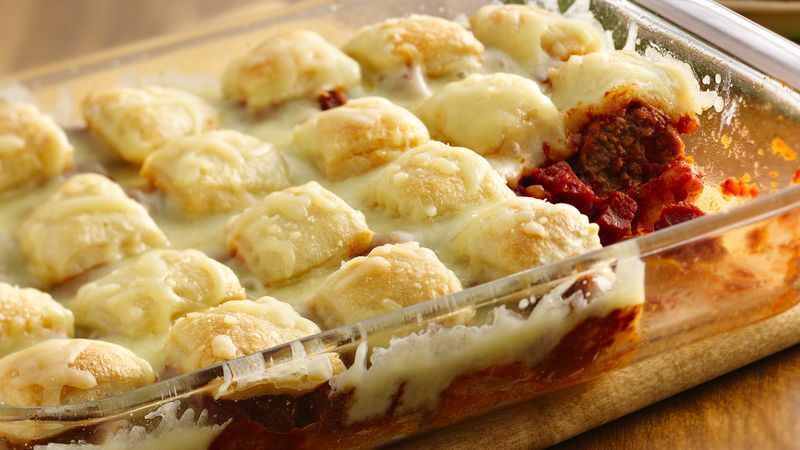 In large microwavable bowl, place meatballs and pizza sauce. Cover; microwave on Medium-High (70%) 5 to 8 minutes or until sauce is bubbly and meatballs are thawed. Stir in pepperoni. Pour over dough pieces in dish; sprinkle with Parmesan cheese. Arrange remaining dough pieces over cheese. Bake 16 to 20 minutes or until edges are golden brown and dough pieces are no longer doughy. Sprinkle with pizza cheese blend; bake 4 to 5 minutes longer or until cheese is melted. Let stand 5 to 10 minutes before serving. Place the frozen meatballs in the refrigerator the night before to thaw; decrease the microwave time. Chucky tomato pasta sauce can be substituted for the pizza sauce.